What a performance from both the squad and supporters at Portsmouth this weekend and we must admit we were surprised to hear lots of supporters that travelled down to Fratton Park talking about the campaign. As well as being a big talking point with the fans that travelled down but we are seeing #SingYourHeartsOut appearing on more tweets and both Shrewsbury Today and Shropshire Star have also published articles regarding the campaign. Now we are proud that we have people talking about the campaign and the fact it has grabbed peoples attention but we now need to start implementing plans to improve or enhance the atmosphere for the remaining games and with that we can now announce a couple of ideas that we have for the remaining 3 of the 4 home games. Dagenham – The Drum Will Be Back that is about all we can do in terms of time scales. 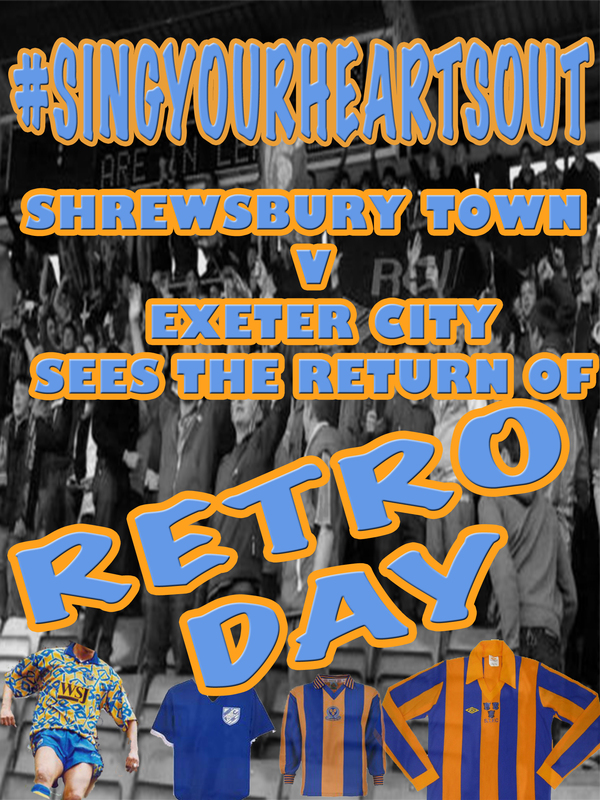 Exeter – We are happy to announce the return of “Retro Day” and we would love to see as many people come and join us in the West Stand. If we can #AllGoWest then we are confident that we will have more people to carry the sound along the and help get all 3 sides rocking for a massive game. York – Blue And Amber day is another idea in the pipeline. This is pretty self explanatory, we want every single Salopian to wear their colours with pride. We are also looking at purchasing up to 1000 balloons for fans to blow up and make it feel like a right old party atmosphere. Plans for Plymouth (h), Bury and Cheltenham (a) will be released in due course but obviously we will be going through the appropriate channels to make sure we don’t step on anyones toes. We have just been sent this from Mike Davies on behalf of Supporters Parliament. The importance of the last 8 games of this season can’t be underestimated. As supporters groups today we unite and put out a call to arms for all supporters though out the county to get behind the club and back the lads onto glory. Our club has come such a long way since our relegation last season by bringing in Micky and Matt Williams who with the full backing of our chairman have stuck to their word and provided a team we can be proud of on the field and a club who once again are moving in the right direction. Promotion is not just achieved on the field, there are other areas that contribute to it, non more so than the supporters and the atmosphere inside the stadium. So It’s now our turn to do our part. We encourage everyone to back the ‘sing your hearts out campaign’ and create an atmosphere within the ground to spur the lads on. We want a sea of blue and amber, so why not bring a friend along ? Let’s fill the stadium, let’s hear those drums and get the Meadow rocking for the season’s run in. These last few games are going to be tense but we as fans must now step up, like the team has this season. Let’s unite to achieve our goal (or goals !!). As a club we win together, we lose together so let’s get promoted together and let’s celebrate together. We have let you have your say in response to our #SingYourHeartsOutCampaign and the response has been incredible with the majority backing the campaign so before we continue we must thank you all for getting behind our vision. Many people have suggested bringing the drum back which is a possibility but unfortunately Alex who is the one who owns the drum has declared that it is broke and hasn’t been able to replace it due to finances! So we turn to you, our fellow Salopians to help with donations to fund for a brand new drum. We have contacted Salop Music and are pricing up a brand new drum to use at all Salop games and hopefully if things go well we will have the new drum at the Dagenham game. As well as that we are looking at different ideas for the 3 other home games which we have left in the season and we will have something to announce in the next 48 hours in regards to the Exeter game. Also we are drawing up a few ideas for the Plymouth game which will hopefully be a complete sell out in anticipation for the promotion party (Championship party even). Obviously everything we do will be put to the club first and we will be looking for co-operation from all parties involved to make sure we don’t upset everyone. As always we are still looking for your ideas as to what you think we could do to improve the atmosphere at Greenhous Meadow. You can send all ideas to salopsbluearmy@gmail.com or tweet us @SalopsBlueArmy and we will take all ideas in to account. As said before we do thank everyone for all your support so far and we hope to make #SingYourHeartsOut campaign a successful one and make Greenhous Meadow a noisy, hostile stadium.